While at a conference in Durban, South Africa in May, I stepped out to the food truck-lined courtyard hoping to snag something healthy for lunch. Tucked between the trucks selling braai, traditional South African barbecued meat, I spotted a teal-colored caravan strewn with lights and vibrant, Indian-style motifs crawling up the sides. On the back, a sign read “This ain’t no hippy hot box motha trucker!” but everything about it screamed the opposite. A hand-written chalkboard menu shared specials of the day, which included a “forest cone” veggie wrap and bunless “naked burger” crafted from eggplant and sunflower seeds. After ordering my wrap, I started chatting with the woman behind the counter, which was stacked with jars filled with my kind of ingredients: pomegranate seeds, pepitas, hummus and hot chili flakes. “Tell the organizers you want us to come back! Most people haven’t been able to find us out here,” said Debbie Rich, founder of the plant-based vegan brand Out to Lunch. Just before she turned 50, the wellness coach decided to embark on a meat- and gluten-free diet that became the basis for her raw and alkaline plant-based brand, which she sells from the counter of her well-worn caravan, lovingly dubbed Clementine. Everything is dairy-, sugar-, wheat- and guilt-free, including desserts like the chocolate avocado mousse. 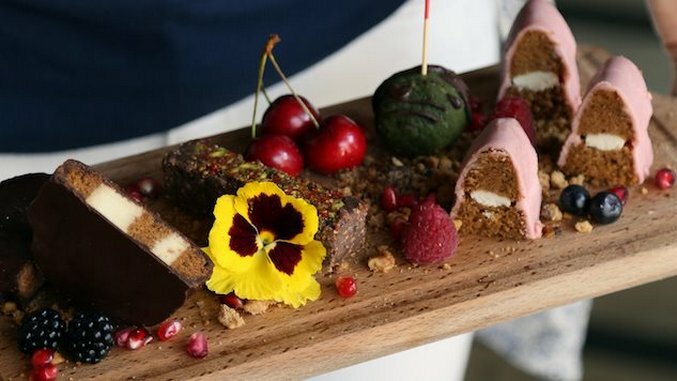 While a pioneer in the plant-based diet movement in Durban, Rich is joining the growing number of chefs and restaurateurs heralding the benefits of vegetarian, vegan and raw diets. From Copenhagen’s Street Food market to major cruise liners like Oceania and Michelin-starred eateries in Milan, vegan cuisine seems to be sweeping the globe as the latest trend to make it to travelers’ plates. Even non-profits like tour operator Karma Waters are tying in elements of travel with tours like a Vietnamese vegan cooking class in Hoi An. During the nine-hour course, travelers can learn how to whip up vegan versions of Vietnamese dishes like turmeric pancake spring rolls and pho noodle bowls alongside local chefs, with proceeds going back to the community and two restaurants in central Vietnam. Recreating lighter, vegan versions of local dishes not only allows plant-based travelers to taste a country’s cuisine, it also offers a healthy alternative for those who are meat-eaters. “Traveling and getting out of a routine is often a worry for my clients, but with the rise of vegan restaurants, healthy options are now fairly easy to come by,” Tamblyn says. In Italy, a country known for dishes like Cassoeula, a pork and cabbage stew, and ossobuco, stewed veal shanks, one restaurant in Milan started pushing the boundaries back in the 1990s with its vegetarian spin on Italian classics. In 1996, Joia became the first vegetarian eatery to earn a Michelin star in Europe, and it’s still the only restaurant to hold one today in Italy. Summer starters pair heirloom tomatoes with chickpea hummus and wasabi-flavored kidney bean pâté, playing on the same textures you’d find in a meat dish. Paris is another city where steak-frites and cheese (of any and all variety) are just as revered as landmarks like the Louvre and Eiffel Tower. In a recent Vogue article, chefs explain how the city is shifting away from meat, as a wave of vegetarian and vegan spots are sprouting up in the city. From legendary chef Alain Passard’s vegetarian L’Arpège (where meals can cost a cool 800 euros—sans wine) to the intimate dining room at 42 Degrés, France’s first 100-percent raw food restaurant, travelers can now get their vegan fix in a setting that can be as stylish or laid-back as they’d like. While some of these eateries focus specifically on one type of cuisine, whether it’s vegetarian, vegan or raw, others, such as Flax & Kale in Barcelona, promote the “flexitarian” mentality. Eighty percent of the dishes here are plant-based and the other 20 percent incorporate oily fish, with markings on the menu indicating if dishes contain dairy, gluten, eggs or fish. In the back of the menu, a list of superfoods are spelled out so you know the health benefits your body is reaping from recipes containing Vitamin C-rich sorrel leaves and strength-enhancing maca. At the three-year-old restaurant, you won’t find vegetarian versions of traditional Catalan dishes, either. Instead, CEO Jordi Borràs incorporates trends and diets from some of the healthiest areas around the world, such as Southeast Asia and the Mediterranean, into dishes that still capture flavors of the region thanks to fruit and produce grown right in the restaurant’s garden.